Coqueta along the Embarcadero. If you are luck you might catch a glimpse of Michael Chiarello chopping up some octopus there. There's a new fried chicken place in North Beach. It pairs will with beer and strippers? Drug cartels are driving up lime prices, so says Tacolicious thus up go margaritas. SFist re-ranks the Bay Areas best restaurants based on some new formula. If, like me, you can't afford $398 here's Saisons full tasting menu in pictures. There's a Guamanian food restaurant in San Francisco, who knew? Glamour shots of chickens?! Why not, it's kind of funny. A whiskey primer from 7x7 so you can look smart when you hit up Hard Water. Yes there are places that still deliver at 2am in San Francisco...drunk dialing time!! That cat cafe has met it's funding goal..looks like it's a go..your move dogs. Food trucks come and go in San Francisco on a regular basis making it difficult to get out there an try everyone of them, though I do try. I'm always on the lookout for new ones to the area and sometimes they pop up with lots of fanfare, such is the case with the Lobsta Truck. Hailing originally from down Southern California way I'd seen several online food news outlets highlight its arrival to town and it was because of this that I grabbed my friend Elena and we made the arduous cross town journey to the Friday night Off the Grid at Fort Mason to give this hot new truck a try. We got there right when the event was starting but the Lobsta wasn't quite ready yet so we wandered around till they started serving. During that time a line had formed at the truck, it seems we weren't the only ones who wanted to give them a try. If you ever need a princess cake, Schubert's Bakery in the Richmond is the place to get it. Western Addition gets its own brew pub. Hipsters really are everywhere now. The Local's Corner guys keep adding more Local's, now a wine cellar. James Beard Awards has locals galore up for finalists. Outerlands will get a new chef to go with it's new larger/renovated look. PizzatheApp wants to be the Uber of getting a pizza when you want/need it. With Off The Grid in full swing now here are 8 new things to try there. Fries, fries and more carbs--here's SFist best french fries in town list. Don't stand in line 3 hours for day old bagels try one of these local joints instead. For the gluten intolerant here are places to still get that pizza fix in the Bay Area. It's just around the corner, here's a list of CUESA greens for spring. I've never been a total fan of ice cream as a dessert, the SO loves it, it's one of his 4 food groups. For me I can usually take it or most often leave it. I like my desserts to have heft to them, like cake or pie or donuts--they are both filling and satisfying when good. Ice cream can often feel like Chinese food to me, after eating it I'm still a little hungry and my sweet tooth doesn't feel totally satisfied. Still I was willing to give Humphry Slocombe a try as I'd heard many good things about over the few years it's been around. Plus we were only a few blocks away strolling through the Mission, it was hot and something different to do. It's a small place tuck on a side street off the 24th Street corridor, which has become a new hotbed of trendy hipster foodie places that draw people there specifically to eat. 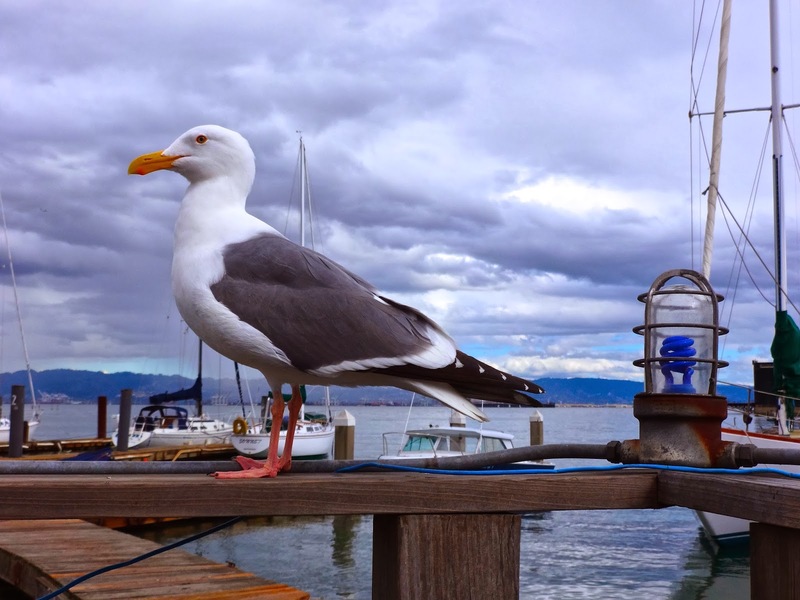 When eating at The Ramp beware the seagulls..they will steal your food. SFist shares what to do while waiting in line for Tosca. Again..why are we waiting? Bacon Bacon did a Reddit AMA...because why not? Thrillists 8 best diners in SF. This list needs to be way bigger and more greasy. Girl Scout Cookie cocktails? Alembic jumps the restaurant shark so to speak. Is Dirty Habit a good name for a new restaurant? Guess we'll find out. 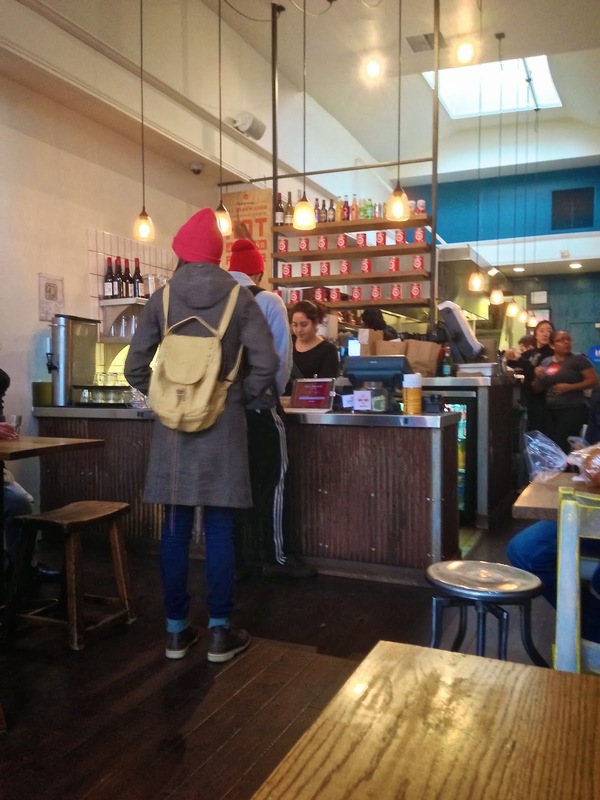 SFist likes them but are these your favorite coffee shops? American Grilled Cheese Kitchen menu gets a revamp--and non cheesy things. Project Open Hand has in Indiegogo fundraiser going for good things. San Francisco is rife with food trucks, food pop-ups and food incubators. All with great ideas for food looking to build an audience and following in hopes of one day turning their dream into a full fledged brick and mortar business. One such success story is Bun Mee. They seem to have made the progression up the foodie ladder to become a pretty popular sandwich shop with not one but two locations. I'd had their takes on a banh mi during their food pop-up/food market days but had yet to try their fully established location on Fillmore. When I saw they opened a second store on Market Street I thought now was a good time to give both of them a try and see how they were holding up. Here's a shot of the inside of both places. Blue Bottle Coffee's indoor stall at the Ferry Plaza actually has TWO ordering windows and the one around to the side is usually shorter. Since they both serve the same thing--shorter is always better. Parts of Oakland join the food truck pod craze and get their own "off the grid-ish" event. ForageSF has a new underground dinner Wild Kitchen coming up in March. Get tix now. SFGate--should cocktails have separate ratings from food? Does it matter after third one? 7x7's list of "casual" spin-offs of high end restaurants. Spin-off doesn't mean cheaper. Don't schlepp to outer Mission for ice cream, Humphry Slocombe opens in Ferry Plaza. Chris Cosentino will close Incanto, reopens more casual--with a retail section. Seriously. Ryan Farr of 4505 Meats shows us how to make a hot dog--to go with that burger. Donut Shops both new and old are still the thing in San Francisco. Can a Thai restaurant really be exciting? Serious Eats seems to think Kin Khao is. I hadn't been to SOMA StrEat Food Park in a while and with the recent spate of mostly sunny, semi-warm days I decided to hit the place up a few times to see if there was anything new and tasty going on. There's a pretty decent lunch crowd on this workday and perusing through I see a few new trucks and hone in on Sabor de San Miguel--a Guatemalan cuisine purveyor.